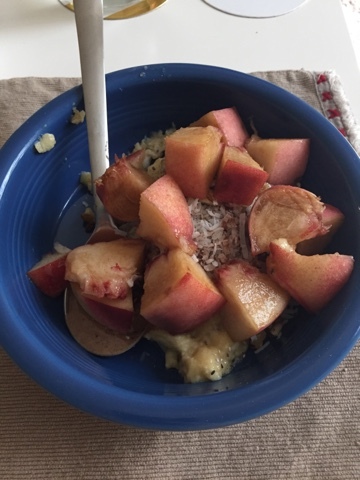 10:30 am Faux-oatmeal (another 11 hours of sleep!!!) Also, I've been doing some shopping at a local Sprouts store and I like the prices, but the produce is super sub-par. It may be organic, but I swear it all goes bad within 24 hours. I bought that peach the day before and I cut into it and it was brown! 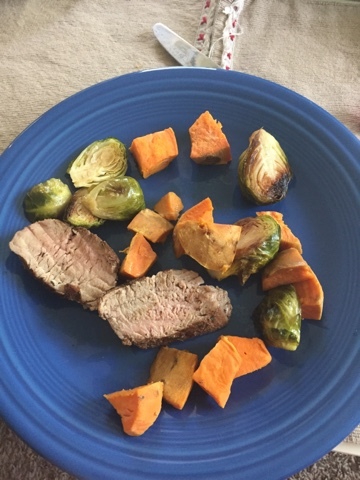 12:45pm Leftover roasted brussel sprouts, sweet potato and pork tenderloin. 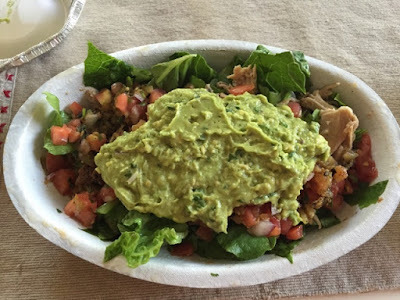 4:45 pm Chipotle salad with salsa, canitas and guacamole. So today was very much a leftover day. I went grocery shopping, but I didn't feel like making anything so I got Chipotle. For some reason I had major stomach pains afterwards. As Matt pointed out "Chipotle is the most un-Whole30 Whole30 thing you've eaten in a month" so maybe thats why? I was laying in bed hoping my stomach would stop hurt. Eventually it did and then I was lying awake thinking about how hungry I was. So I ate a fried egg as a midnight snack. It was delicious.